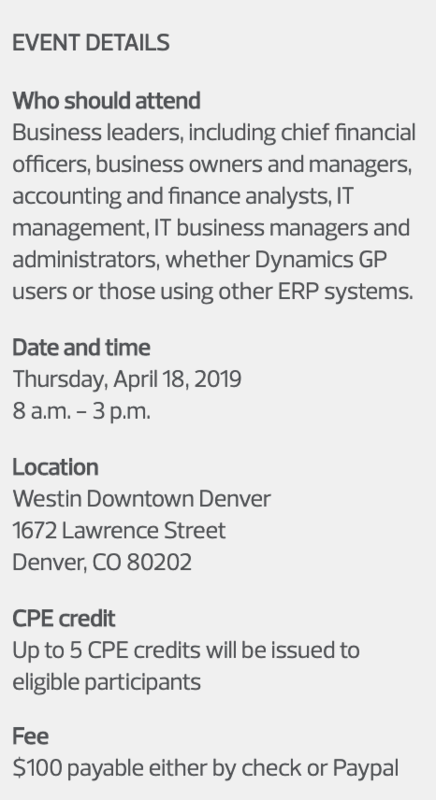 Learn about the latest in Dynamics GP, various other ERP solutions and other important topics for middle market businesses while optimizing the value you provide to your organization. Earn continuing professional education (CPE) credits while networking with your peers, our sponsors and the Denver-based RSM team. RSM is offering two tracks of educational sessions. Dynamics GP–designed for GP users who want to get more out of their user experience, and Tech Discovery–designed for leaders/managers of organizations who are interested in exploring alternate ERP systems and other timely topics for mid-market businesses. RSM is offering two tracks of educational sessions. Dynamics GP–designed for GP users who want to get more out of their user experience, and Tech Discovery–designed for leaders/managers of organizations who are interested in exploring alternate ERP systems and other timely topics for midmarket businesses. As always, you are not limited to a single track at the event–both tracks are open to anyone who would like to attend. Our focus is to bring in topics that can assist in the sales process, the everyday GP user and the decision maker. Dynamics GP track: You’re an intermediate to experienced GP user who is in the software daily/weekly. You could benefit from hearing about how to get (and give) more value from GP, including helpful tips and tricks around reconciling month, getting rid of some of the spreadsheets and getting more out of your GP system, and reviewing GP reports that you may not be leveraging today. Tech Discovery track: You’re a decision maker at your organization—a controller, vice president of finance, chief administrative officer, chief financial officer, CEO, etc.—who is interested in learning more about how to get more value from your ERP investment. You will learn more about recommended alternatives to consider as you begin thinking about your next ERP system. Other topics will include Dynamics 365 CE (CRM), budgeting and forecasting, and technology considerations related to the new leasing standard—ASC 842.